I was happy that I dont need to grip the ball with 3 fingers only, because I have kinda small hand, and when I put my thumb right under (and between) my index and middle finger I never hade stable grip. What you guys think about this kind of grip? I have one question tho. With this “new” 4 point grip, I dont need to put my thumb under and between my middle and index finger again, right? well, that’s plausible but, tom glavine do not have a good fastball velocity wise so does it changes the speed of the ball? maybe yes maybe no. he changed his delivery though, he didn’t loose mphs, he just doesn’t throw his full capacity. 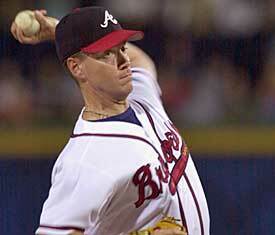 greg maddux do the same. anyway, gripping your fastball with more fingers sure increase the amount of pressure around the ball. 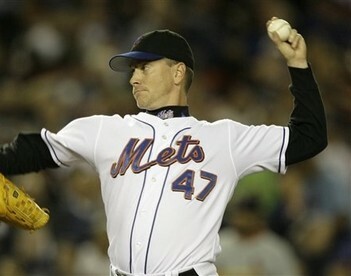 I saw Daisuke Matsuzaka grips his 4 seam fastball in almost the same way. Lets see what others have to say on this topic. As the photo below of Curt Schilling makes clear, it doesn’t matter if you grip the ball with a 4-point grip (as Schilling is doing in the photo) or a 3-point grip since the ball comes off of the index and middle finger. I consider this myth BUSTED. i don’t think you and your pictures get what a 4-point fastball is since your ring finger will probably always be touching the ball at some point. anyway, just wanted to let you know your pictures are actually a guy holding a ball with 3 fingers so that’s just random. This is exactly the point. The ring finger on the ball makes it a 4-point grip, not a 3-point grip. This is an issue because many people talk about the ideal being a 3-point grip, which can’t be achieved by many people (if any). You’re contradicting yourself. If the thumb and ring finger are both on the ball, then it’s a 4-point grip. they are holding the ball with their index middle finger and thumb. everything else just hang in there and shouldn’t be considered a distinct point of pressure on the ball since the only way to take this fingers off the ball is to cut them. a 4 point fastball grip like you’re talking about would be something the would look like a kind of palmball or change-up grip without your pinky finger touching the ball. in other words you circle the ball with your fingers and that distribute the pressure around the ball instead of behind the ball and could be considered a bad way to hold your fastball. a lot of little kids hold it like that because they are scared the ball will fly off their hand while throwing. consider a 4-point of pressure fastball to be something like a 3-finger change-up. You make a good point. The grip has as much to do with which fingers are applying pressure and where, then as to how many are making contact. Trevor Hoffman’s “box change” has all five fingers on the ball, pinky and index finder on the sides, middle and ring finger on top, thumb below. Some clarity as to who “many people" are, would be informative. Perhaps a large number of noted pitching instructors who say the ring finger should never be making contact with the side of the ball when griping it with your index, middle finger, & thumb? Now if he would not hang it so often. Thats the danger of throwing the “hard curveball”, Ian.